Casting away from the docks just as the sun is starting to rise, we retrace our steps out the skinny water of Shallowbag Bay and pick up the Roanoke Sound Channel. We follow this narrow but well buoyed channel for about ten miles as we work our way south between Roanoke Island and the Outer Banks. 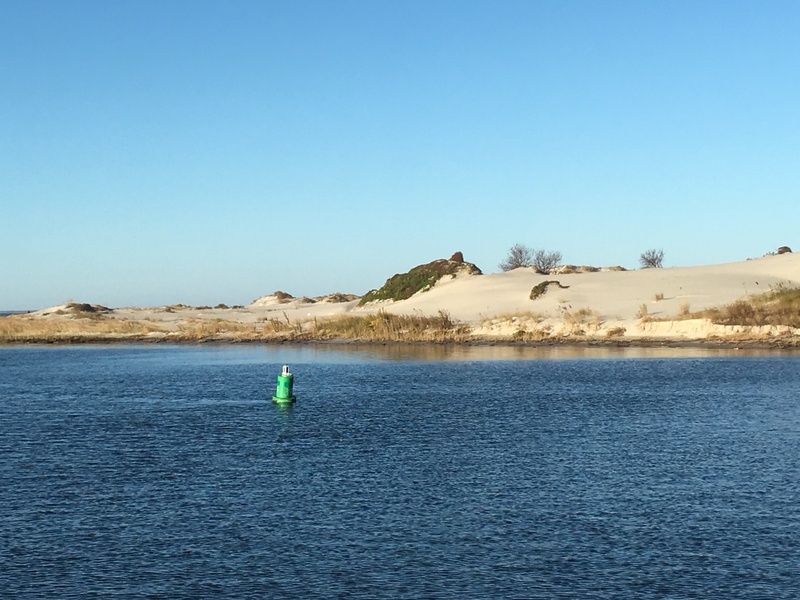 Near the Oregon Inlet we pick up the buoys of the Old House Channel. Things were really confusing at this intersection. We actually went on the wrong side of our first green buoy. What a rookie mistake! Luckily we sorted things out before running aground. 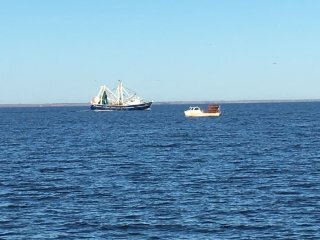 Back out in the wide Pamlico Sound we can relax and enjoy the trip. We have fantastic weather and the sound is flat calm. 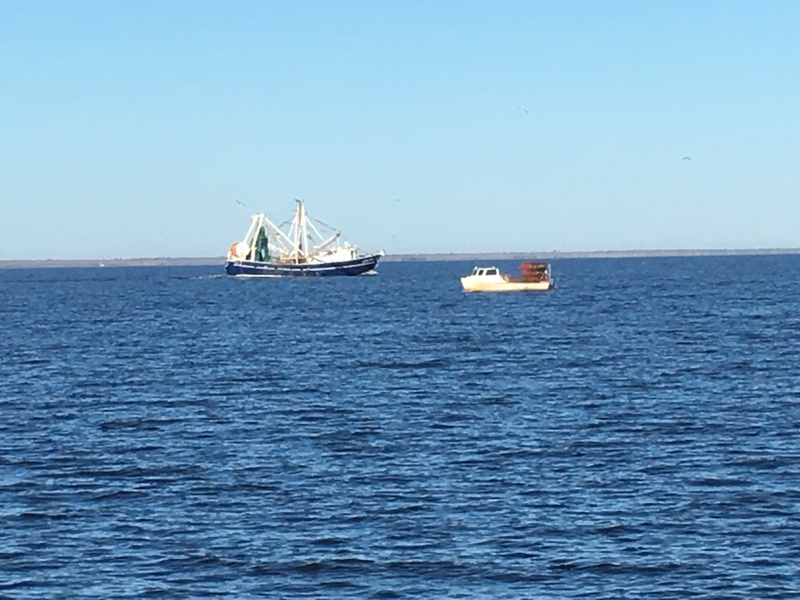 The Pamlico Sound is the second largest ICW estuary behind the Chesapeake Bay and it can get very rough when the wind blows. The calm day gives Nate and Primo a chance to join us on their t-stand up in the pilot house. 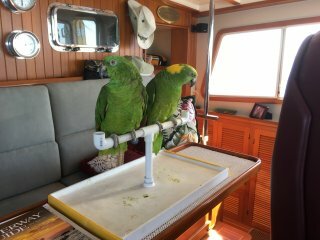 They seemed to enjoy this but Primo did get a little nervous when the seagulls hovered just off the bow of IT. Other than a few crabbers and one shrimp boat, we have the waterway to ourselves. Almost all of the boats migrating south take the ICW route. Our route is actually 30 miles shorter and much easier when the weather is good. I don’t know why more boaters do not use this route. I guess just like us, one tends to follow that which is known and protected. So far we are happy exploring this new area. 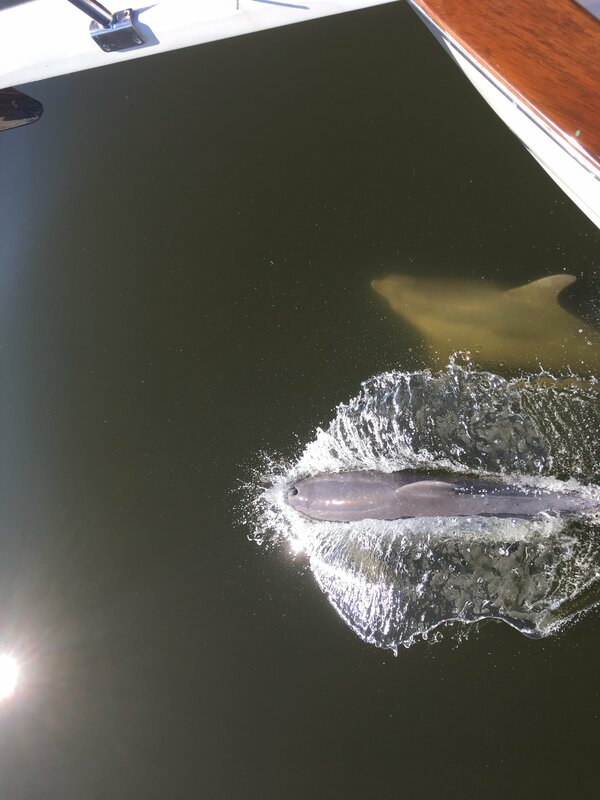 The dolphins join us as we near Ocracoke Island and spend some time riding our bow wake. Big Foot Slough Channel is our path into Ocracoke. Because this channel is used by the ferries, it is dredged to 10 foot depths. The channel shoals constantly and temporary buoys mark the current route. Earlier today we heard the ferry talking to a boater who had run aground. We make note of the ferry captain’s comment “ stay on the green side for more depth”. We cautiously go from buoy to buoy making several twists and turns until we reach the protected harbor of Silver Lake. 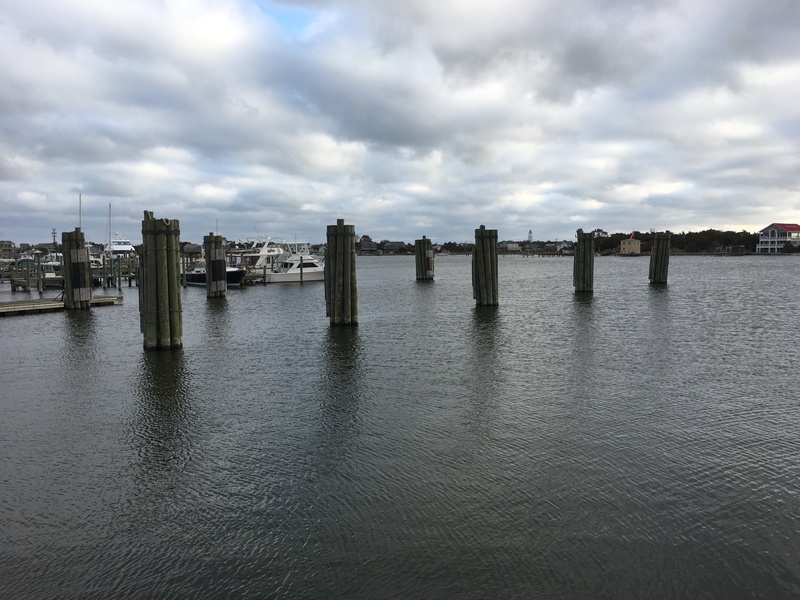 The National Park Service maintains two 125 ft. piers with adjoining bulkheads for transient boaters on a first come first serve basis. Being a Saturday and also Halloween weekend, we find all the docks occupied. There are about eight sailboats in the anchorage but we are able to find a spot amongst them to drop the anchor. Sunday morning we see one of the sailboats leave the National Park bulkhead. We quickly raise the anchor and squeeze into the vacant birth. 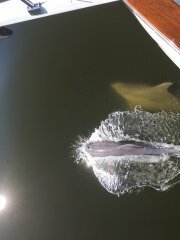 Just as we are docking, we see a couple on the docks waving to us. It is the owners of the Ford Dealership in Manteo that we had rented our car from. They have a summer home here in Ocracoke. They graciously give us a quick tour of the island in their 4WD truck including a drive on the beach. We make note of several places to return later on our bikes. 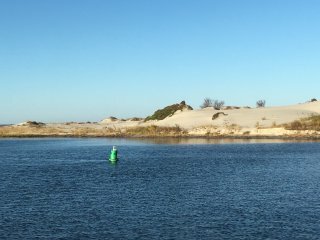 Ocracoke is part of the Cape Hatteras National Seashore and can only be reached by boat or air. 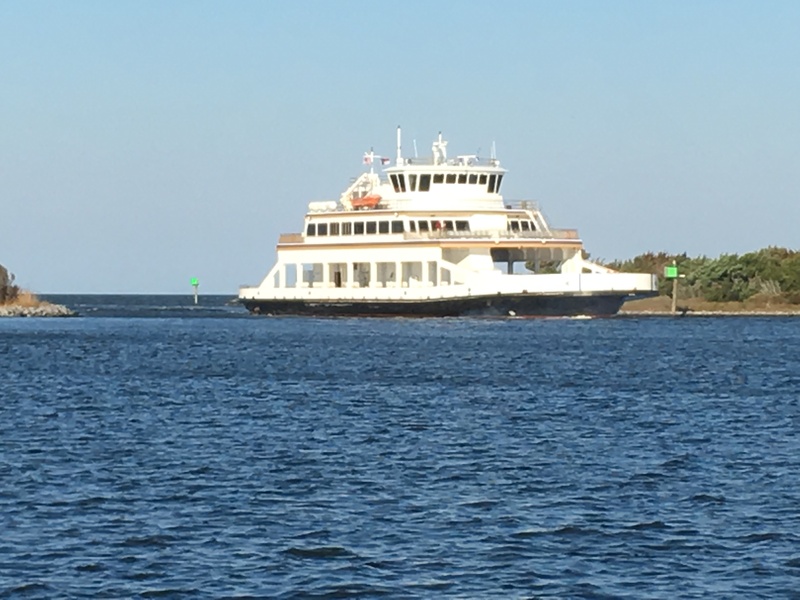 Large car ferries make numerous trips into the Harbor each day. The village of Ocracoke surrounding Silver Lake is the hub of activity on the island with numerous restaurants and shops. 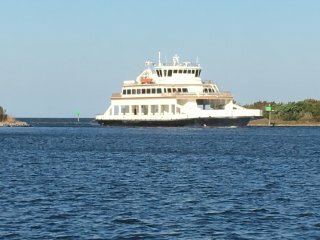 Lake Manteo, Ocracoke is rich in history. 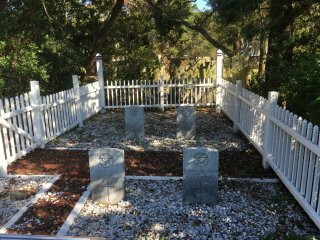 Edward Teach, aka Blackbeard, was killed and beheaded just off Ocracoke in a place known as Teach’s Hole. Supposedly Blackbeard’s treasure is buried here on Ocracoke. Maybe we will find it in our explorations. While discovering town, our first stop was the British Cemetery where four British sailors are buried. Their bodies were recovered from the sinking of the HMS Bedfordshire. British tradition called for them to be buried on British soil so the small graveyard was leased to Great Britain in perpetuity and is maintained by the U.S. Coastguard. Just beside our docks are a series of huge wooden bollards left over from the PT boats that were stationed here during WWII. The Navy Beachjumpers, fore runners of the Navy SEALS, were also stationed here in the 40’s. With the bikes down, we head out of town along the bike path which will take one north 14 miles to the end of the island. 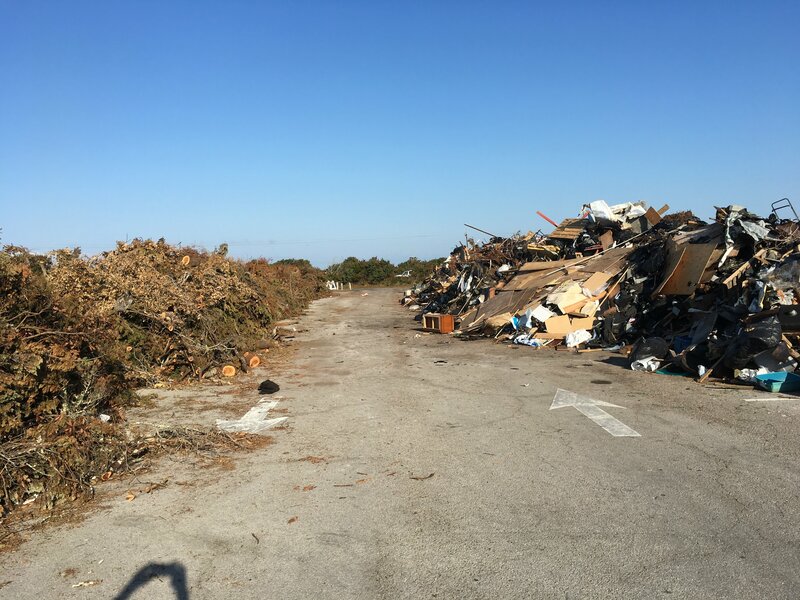 Just a few miles outside of town we find the local trash pile from Hurricane Mathew. These damaged and discarded items along with tree debris are being stored here until FEMA call haul it off the island. Back in town we stop for lunch at Edwardo’s, a Mexican food truck. It came highly recommended by the locals and they did not steer us wrong. The burritos were amazing. 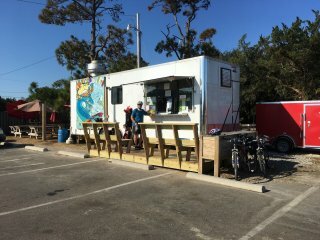 Our next stop was the local Fishermans co-op for some fresh flounder, shrimp, and scallops. We also snagged the last two slices of a locally made fig cake. Several types of figs are grown on Ocracoke. Our cake is said to be made by the expert, a local 80 year old resident who bakes these daily. Dinner tonight is baked flounder and scallops followed by the fig cake. And yes, the fig cake was fantastic. This entry was posted on November 8, 2016 at 10:36 pm. You can follow any responses to this entry through the RSS 2.0 feed. You can leave a response, or trackback from your own site.